Algerian President Abdelaziz Bouteflika, who led the North African country for two decades, announced on Monday that he will resign by the end of the month. It follows months of protests and growing calls for his removal from office. A brief statement from the presidency said Bouteflika, who is 82 years old, will be stepping down after taking “important measures” to ensure the continuity of government. Details about the transition were not immediately released. “The resignation of the President of the Republic will occur before April 28, 2019, the date of the end of his term in office,” the presidency said, according to the APS news agency. Monday’s news follows months of growing protests in the capital. Bouteflika, who has rarely been seen in public since he suffered a stroke in 2013, initially filed paperwork to run for a fifth term in the April 18 presidential election. Despite assurances that he would step down early if re-elected, weekly street protests continued to grow and Bouteflika withdrew from the race on March 11. He also postponed the election. A new date has not yet been set. Last week, Bouteflika lost the support of Army Chief of Staff Lt. General Ahmed Gaed Salah, a key ally who was vital to keeping the president in power. The army chief called on the constitutional council to declare Bouteflika unfit under Article 10 and to remove him from office. Bouteflika joined the National Liberation Front in the late 1950s to oppose French colonial rule during the War of Independence. He quickly rose through the ranks and became foreign minister in the first government of independent Algeria in 1963. 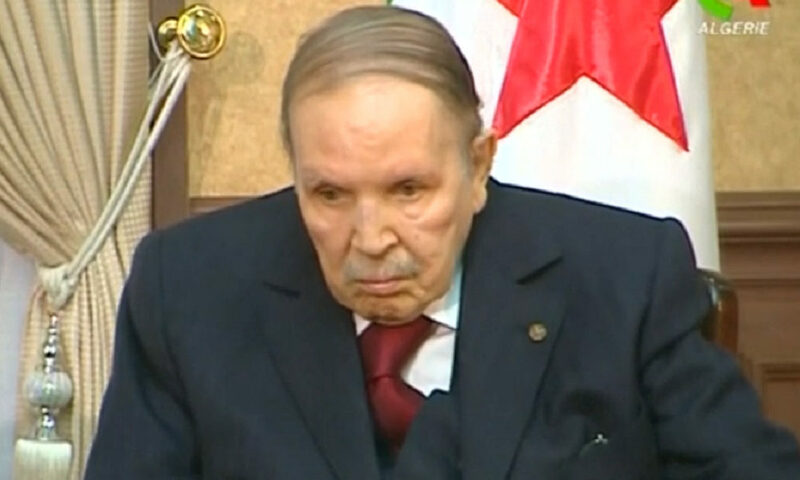 When President Liamine Zéroual suddenly resigned in 1999, Bouteflika announced his candidacy with support from the military. He won the election with nearly 75%, but all other candidates had withdrawn just a day prior to the vote, alleging that fraud would guarantee Bouteflika’s victory. Bouteflika was credited with bringing relative peace to the country by ending a civil war that claimed at least 150,000 lives in the 1990s. Over the past decade, protests grew amid rising food prices, poverty, and high unemployment.